If you haven’t heard by now, amino acids have taken center stage in the world of food and health. The number of people who are actively seeking healthier skin, hair, and nails is growing and so is the number of people who are adding supplements to their daily diets. Because of this, collagen peptides have made their mark on the health and wellness scene in a very big way. Your body uses amino acids to build muscle, bone, cartilage, skin, hair, connective tissue, and more. But your bones, joints, and skin are most dependent on collagen to stay vibrant and healthy. Unfortunately, as we age, the collagen in our bodies decline and that’s where supplements like collagen peptides come in. Some studies have shown taking collagen daily works within to enhance your skin, hair, and nails. It also restores skin’s moisture and elasticity as well as tone and vibrancy to help combat the signs of aging. 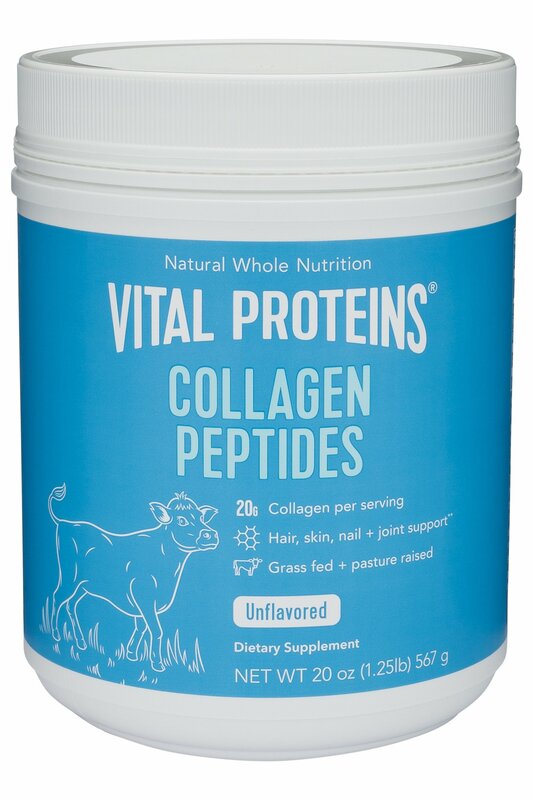 After doing market research on brands, ingredients, reviews, and the many options for collagen peptides, I chose Vital Proteins because it is sourced from grass-fed, pasture-raised bovine hides to ensure a natural, high quality, and sustainable source of this ancient nutrient. I also like it is gluten-free, dairy-free and compatible with a paleo, Whole 30, or kosher diet. My favorite thing about collagen peptides is the versatility of incorporating it into my recipes like this Collagen smoothie recipe of mine. It is soluble in cold or hot liquids and is completely flavorless. You can use collagen for a variety of recipes including smoothies, soups, sauces, coffee, tea or plain water. 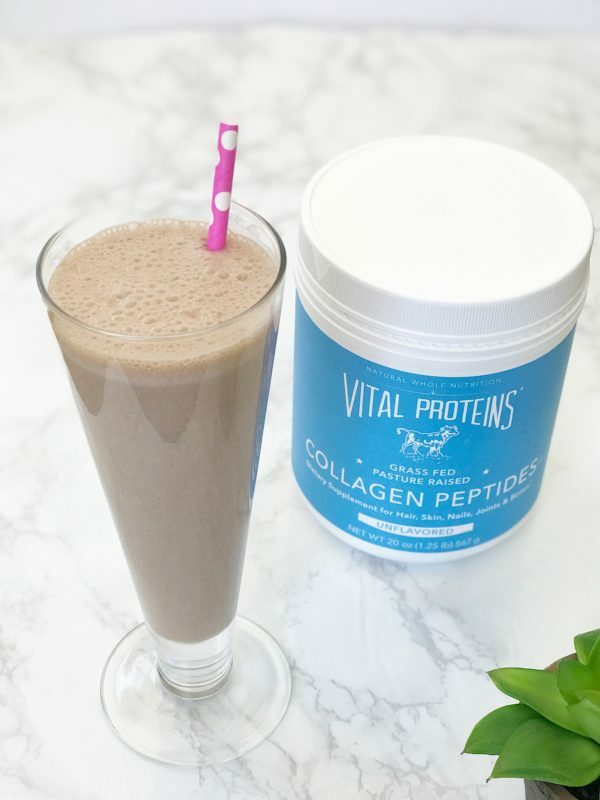 I especially love to add 1-2 scoops of Vital Proteins collagen peptides into this creamy banana chocolate shake for a quick and easy breakfast or a mid-day snack. Give this one a try. I would love to hear how collagen peptides work for you! Cheers to a healthier you! For this Banana Chocolate Collagen Shake, all you have to do is blend the ingredients and pour into a glass, taking only 5 minutes to make this healthy shake! Place all ingredients into blender and process on high for 1 minute.